1961 The Brandenberg Gate in Berlin, Germany was closed during the production of Billy Wilder's Cold War comedy One, Two, Three (1961), forcing the studio to build a replica on a sound stage. The closing of the Gate was the precursor to the construction of the Berlin Wall (begun in August 1961) -- and led to the film's famous opening lines, delivered in voice-over: "On Sunday, August 13th, 1961, the eyes of America were on the nation's capital, where Roger Maris was hitting home runs #44 and 45 against the Senators. On that same day, without any warning, the East German Communists sealed off the border between East and West Berlin. I only mention this to show the kind of people we're dealing with - REAL SHIFTY!" 1961 The action war film The Guns of Navarone (1961) starring Gregory Peck, had one of the most expensive budgets of films at the time, at $6 million, and was one of the top-grossing films of 1961, along with Disney's animated 101 Dalmatians (1961). 1961 Screen great Gary Cooper died at the age of 60 of cancer. His long career had spanned from the silent film The Vanishing American (1925) to The Naked Edge (1961, UK), the year of his death. Among his over 100 films, his most notable were his first sound film The Virginian (1929), Mr. Deeds Goes to Town (1936), Sergeant York (1941) (winning his first Best Actor Oscar), High Noon (1952) (winning his second Best Actor Oscar), and Friendly Persuasion (1956). 1961 Italian actress Sophia Loren was the first to be nominated for (and win) an acting Oscar for a Foreign-Language film role - in a film that was not in English. She appeared in director Vittorio De Sica's sub-titled Italian film Two Women (1960, It.) (aka La Ciociara) (the film's sole nomination) in the role of Cesira. It was the first of Loren's two career nominations, and was her sole Oscar win. 1961 With his Best Actor Oscar win for his performance as Hans Rolfe - a disturbing Nazi-German defense lawyer who defended the Nazi generals for war crimes in Judgment at Nuremberg (1961), Swiss-born Maximilian Schell became the first performer to win an Academy Award for recreating on screen a role he had originally performed for television. It was the first of three career nominations - and his sole Oscar win. Schell's role was basically a supportive one, and he was listed fourth in the cast. 1961 Director Henry Koster's musical Flower Drum Song (1961), the movie version of the Rodgers and Hammerstein stage musical, was the first Hollywood movie musical with Asian Americans as leads. It was a step ahead of other pictures featuring Asian-Americans, although it was still dated, was made by non-Asians, and was marked by typical Asian stereotypes - including a docile, quiet and respectable picture bride for an arranged marriage (Mei Li portrayed by Miyoshi Umeki) and a flashy, gold-digging showgirl (Linda Low portrayed by Nancy Kwan). 1961 Alain Resnais' enigmatic, puzzling, hallucinatory, and dream-like Last Year at Marienbad (1961, Fr.) (aka L'Année Dernière à Marienbad), was a film that explored the themes of time, truth and memory. It was one of the first films in a strong wave of post-war European art movies in the early 1960s. 1961 Leonard Bernstein's 1957 Broadway hit West Side Story (1961) was adapted for the big screen four years later, receiving eleven Academy Award nominations and winning all but one - Best Adapted Screenplay. Its achievement as a ten Oscar winner was only surpassed by three other films (each with eleven Oscars): Ben-Hur (1959), Titanic (1997), and The Lord of the Rings: The Return of the King (2003). Its many Oscars included wins for Best Picture, Best Supporting Actor (George Chakiris), Best Supporting Actress (Rita Moreno), and Best Director (co-directors Robert Wise and Jerome Robbins). The Best Director Oscar marked the first time that an Academy Award was shared by co-directors, and Robbins was the only Best Director Oscar winner to win for the only film he ever directed. West Side Story (1961) was also the top grossing film of the year with $43.7 million (domestic) revenue. 1961 Audrey Hepburn starred as NYC socialite Holly Golightly in Breakfast at Tiffany's (1961). Henry Mancini won two Oscars (Best Score and Best Song - Moon River) and four Grammy Awards for his musical score. 1961 Disney's One Hundred and One Dalmatians (1961) was the first feature to solely use a Xerox process for transferring animator's drawings to cels. It was especially crucial for this film, because of the many spotted dogs. It took in a gross of $14 million (domestic), making it one of the top ten hits of the year. 1961 Director William Wyler's controversial The Children's Hour (1961) with its still muted theme of alleged lesbian-homosexuality - a remake of Wyler's own sanitized These Three (1936), was released and given a seal of approval by the Production Code - now amended to allow homosexuality as a screen subject. 1961 TWA exhibited the first in-flight feature film on a regularly-scheduled commercial airline. It was MGM's and director John Sturges' By Love Possessed (1961), an imitation of Peyton Place (1957) -- starring Lana Turner (as unfaithful, alcoholic wife Marjorie Penrose) and Efrem Zimbalist, Jr. (as Arthur Winner, her illicit lover and law partner of Marjorie's husband), shown on TWA flights from New York to Los Angeles. 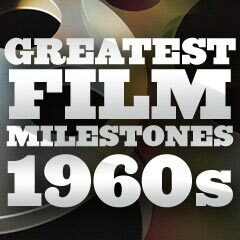 It has also been noted that director Robert Mulligan's Come September (1961) was the first film to be shown on trans-continental and inter-continental flights. [It was the biggest box-office hit for Italian actress Gina Lollobrigida during her career.] Actor Walter Slezak hand-delivered the film to TWA for the inaugural in-flight-film flight. 1961 The film How to Marry a Millionaire (1953), the first wide-screen CinemaScope Hollywood comedy, was the first film to be aired on the weekly NBC series Saturday Night at the Movies - in September of 1961. 1961 Charles Waters' romantic and enchanting fantasy-musical drama Lili (1953) became the first film ever to be adapted into a Broadway musical in 1961, named Carnival. 1961 Method actor and maverick auteur film-maker John Cassavetes' low-budget, black and white, non-Hollywood studio film Shadows (1961), was his first directorial effort - deliberately created as a contrast to Hollywood's studio system. The self-financed, self-distributed cinema verite film (initially shot in 1957) with a jazzy score was a story set in New York about an inter-racial couple. It was first publically screened in 1958, but then withdrawn, reshot in 1959, and then re-released - first to European audiences and then to US audiences in 1961. Shot on 16-mm film and using a non-professional cast and crew, the improvisational film symbolized the emergence of the New American Cinema movement, and inspired the growth of underground films and other independent ("indie") and personal works. 1961 The daringly courageous, landmark UK film, Victim (1961), a noirish thriller starring leading man Dirk Bogarde, was the first important British film with a non-judgmental homosexual theme - a major turning point. It was the first English-language film to use the word "homosexual." Without prejudicial stereotypes, its message was tolerance at a time when homosexuality was considered a crime in the UK and US. [Six years later, the Sexual Offenses Act of 1967 finally decriminalized homosexuality between consenting adults over the age of 21 (with a number of exceptions) in the UK.] As it pushed the boundaries of permissiveness, it was denied a 'seal of approval' from the MPAA for its US release in 1962. 1961 Marilyn Monroe's last completed film, before her death in 1962, was director John Huston's anti-western The Misfits (1961) -- it was also the last film of screen icon Clark Gable. 1961 A search commenced for the first James Bond actor, after UA announced it would produce seven films based upon Ian Fleming's 007 British super-spy, to be produced by Albert R. Broccoli and Harry Saltzman. Cary Grant, James Mason, Patrick McGoohan, and David Niven, were considered for the role, ultimately given to 30 year-old actor Sean Connery.